The Little Cotton Rabbits blog is one of the most popular knitting blogs online – this week we caught up with its author, Julie Williams to find out where her inspiration for those darling animals comes from! Girl cat, by Julie Williams – Julie’s patterns are hugely comprehensive, including step by step instructions and illustrations too. When did you start knitting? What was your first project? I was around 9 years old when I first learnt to knit properly. I remember being given a little knitting kit for Christmas one year – a little bag with plastic chunky needles and two balls of squeaky acrylic yarn. My Gangan (granny) and my mum were avid knitters and between them passed on to me a love of making things from yarn. I was very proud when I finally managed to finish my first ever project which was a red garter stitch scarf for my doll. What was the inspiration that led you to knitting your fabulous animals? It was really having children of my own. I knitted a lot of ‘little stuff’ for them – cardigans, jumpers, booties and lots of knitted toys. I made a few toys from a variety of patterns and having got a feel for different ways of shaping I started coming up with my own patterns. I made lots of things for friends who were having babies at the same time and that began to snowball when the local playgroup asked for a troupe of teddies and I started having requests for knitted toys from other playgroup mums. At around the same time a friend of mine was developing her gift business in London and she asked for a few knitted rabbits to sell. I was very lucky that word of mouth brought new business my way and as a result I ended up supplying quite a few shops and gift businesses in London and then I started the blog in 2006 which led to a whole new world! I’ve always had a soft spot for the elephants. Now I feel mean for picking out one animal, because they all have some favourite elements for me! We adore the clothes that you design for the animals, which have you enjoyed making the most? Thanks so much. I love making different designs for the dresses and often I’ll make a dress first and then knit the animal to go with it. I’ve just made a Christmassy reindeer dress which I really enjoyed. We notice you do love some fine shawl knitting on your blog – do you prefer working with finer yarns rather than chunkier weights? I like variety most of all, so if I’ve just used a worsted/aran weight yarn for something like wrist warmers or a blanket then I like to knit something with finer yarn next. Though I must admit that worsted weight is probably my favourite yarn weight simply because the project grows more quickly! Knitting or crochet? Which do you love most? Knitting definitely, it will always be my first love. You talk a lot about your son Toby on your blog – have you knitted him anything that he has really loved? Not Toby so much, though he did like chewing a teddy I made him when he was little but my daughter Amy still has all of my prototype animals and a big collection of ones I made just for her, her favourite was a pink bunny. 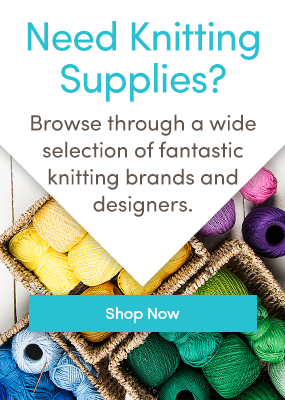 What is on your knitting list for the future? Anything small – I no longer seem to have the patience for larger projects. I spend most of my time knitting the animals but if I fancy a change it’s always something quick like gloves or scarves. Knitting something small is a lot more fun than embarking on a whole jumper because you can start the day with a ball of yarn and end it with a finished item. I like projects that grow quickly on the needles. If you were a yarn, which would you be? And – if you were one of your animals, which one would you be? Oh I’d be a mouse, I’m a bit shy and I like curling up in a cosy corner! Explore Julie’s gorgeous patterns here – you might just have time to knit one before Christmas! Interested in how designers tick? Follow us on Bloglovin’ and don’t miss a post! Last updated: December 10th, 2015. I just feel happy when I looke at Julie’s little animals. I would have loved them as a child because I love them as an adult! My Great Grand Children absolutely love the knitted animals, these all look great. Sorry my first post has the wrong email address. I would like to know how to get all of Julie Williams animal patterns? Hi Linda, just take a look in our Patterns section – this link will take you to Julie’s patterns! This link will take you to all of Julie’s fabulous patterns!